Wow! 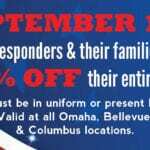 Big thanks to Taco John’s (and owners Jeff and Debbie Bremer) for hosting this special for first responders and their families on Sunday, September 11, 2016. First responders: make sure to swing by a Taco John’s and pick up your discounted meal!